Although new drug candidates show great promise in its efficacy, further development is limited due to their poor solubility. Globally, this trend is on the increase. Since 1999, our business offers various solutions to increase the solubility of poorly water-soluble drug by spray drying technology. Amorphous solid dispersion is a proven solution among them and we have numerous success stories. Amorphous solid dispersion technology can significantly enhance solubility and bioavailability of poorly water-soluble drugs, and reduce differences in drug absorption between fed and fasted conditions. The manufacturing process of amorphous solid dispersion using a spray dryer is straightforward. 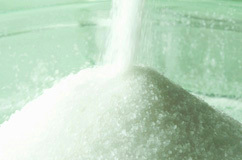 In general, API and inert polymer are dissolved in organic solvents and spray dried to produce solid dispersion powder. Although amorphous solid dispersion can be prepared through several methods such as melting, solvent, melting-solvent or heating-melting-kneading method, the spray drying route has many advantages over other methods. The figure shows XRD patterns of acetaminophen solid dispersion (acetaminophen: PVP = 1:0.35) prepared by spray dry, melting and evaporation methods. 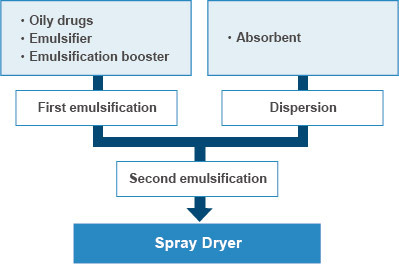 Only the spray dried product shows a halo pattern, indicating the spray dry method can produce amorphous solid dispersion with higher drug load. The XRD patterns of the acetaminophen solid dispersion (acetaminophen PVP = 1:1) obtained by different methods after being allowed to stand for 24 h at 60ºC are shown. All the curves show the halo pattern immediately after the manufacturing stage, but only the SD product exhibits the halo pattern at 24 h after manufacturing, indicating the advantage in stability over other methods. 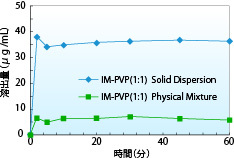 This graph shows the dissolution profile of indomethacin solid dispersion (indomethacin : PVP = 1 : 1). 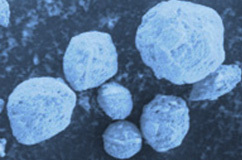 The apparent solubility of the indomethacin solid dispersion is about 6 times that of the physical mixture. 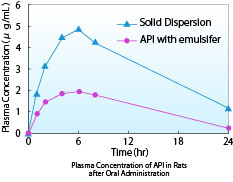 This graph shows the pharmacokinetic data obtained after administration of a compound A solid dispersion in rats. The AUC of the solid dispersion is higher than that of the pulverized product with emulsifier. 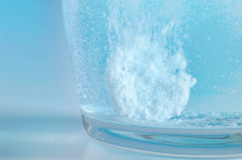 Since 1964, for more than 40 years, Fuji Chemical has provided contract manufacturing services for improving the powder properties of APIs and drug intermediates. To illustrate an example, we have developed processes to obtain various powders with a particle size of 3–4 microns or excellent molding property/tabletability by controlling the size, bulk density and morphology of the SD particles. With our extensive experience and expertise in SD production, we can address various customer needs concerning the powderization of APIs and improving powder properties. We can convert any oily compound into powder by SD. Based on our original emulsion stabilization technology and knowhow of excipients, we can obtain high yields of powder containing high concentration of oily API. 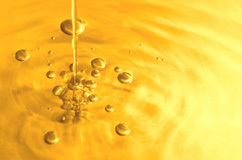 We have manufactured a number of oily APIs as well as health foods. On the basis of the well established SD technology, we developed F-MELT® Technology - an orally disintegrating tablet system to assist your ODT development. Using this technology, we can manufacture customized excipients that suit your APIs and prepare ODTs effectively. Furthermore, co-spray drying API and F-MELT® components can facilitate the manufacture of ODTs when blending API and F-MELT® is difficult.